In 2000, Ashwari said “the army of occupation and the settlers have become legitimate and select targets of Palestinian resistance.” Upon this basis she justified the torture and lynching of two Israelis who took a wrong turn into Ramallah. In 2001 she ostensibly justified the killing of Israelis by Palestinians with her comment, “The only language [Israeli PM] Sharon understands is the language of violence”. In 2014, following the Har Nof attack, she blamed Israel for the massacre saying the occupation “will generate apparent behaviour”. Such support of terror is in keeping with the PLO charter which states (Article 9) “Armed struggle is the only way to liberate Palestine”. In 2012 David Harris said of Hanan Ashrawi that she “is to Truth what Smoking is to Health” because she asserted there were no Jewish refugees from Arab countries. Last year the UN held a special event to acknowledge the true history. In 2014, Ashrawi said that allowing Jews to visit their holiest place – the Temple Mount – is “a declaration of war against Islam”. Denying Jewish people the right to visit their most holy site, because it is also a holy site to other religions, is a denial of the ancient historical Jewish connection to the land. It is a distortion and revision of history. Nevertheless, Israel has not allowed Jews to pray at their holy site for the sake of peace, while Palestinian leaders have used fictional changes to the status-quo as incitement. Does Obama in fact know the relationship, for example, between “Passover” and “Christian blood”? Or “Passover” and “Jewish blood rituals”? Miftah has also praised female terrorists, justified suicide bombing, and is explicitly against co-existence and dialogue with Israelis. Yet Radio NZ presents Ashrawi as a moderate. Like Ban Ki-moon, Ashrawi said the recent violence is the younger generation saying “we’ve had enough”. Unlike Ki-moon, however, she did not condemn the violence. Instead, she said that Israel used “any pretext” to shoot Palestinians. John Greaves did not ask if she condemned the attacks but seemed to agree that “the root cause” was Israel. Such an analysis ignores many things, most importantly the role of the Palestinian Authority in the attacks. PA leaders and religious leaders have incited violence, “martyrs” are paid by the Palestinian Authority based on the number of Jews murdered, and they name streets after terrorists. If John Greave thinks the Palestinians are humans with a conscience, he did not show this. He failed to challenge the premise that legitimate resistance includes attacking pregnant women with knives, murdering parents in front of their children, attacking babies, or killing the elderly. Though Ashrawi is said to have resigned from the PLO after Arafat failed to replace ministers accused of corruption, there was no hint that the Palestinians are responsible for any part of their plight. Ashrawi alludes to but does not acknowledge that there has not been a Palestinian election in eleven years or that corruption is still rife. John Greaves did ask about the lack of unity in the Palestinian government but did not question Ashrawi when she blamed only Hamas. The first question Greaves asked of Ashrawi was when her activism started; she said it was in 1967, when Israel started to occupy the West Bank and Gaza. This is telling, because before 1967, Jordan occupied the West Bank and Egypt occupied Gaza. Objective evidence suggests health was much improved in these areas after Israel won the 1967 war. When Jordan occupied the West Bank, Israelis of any religion and all Jews were forbidden from entering the Old City of Jerusalem, ancient synagogues were systematically destroyed, and Jewish gravestones were used to build Jordanian army barracks. Ashrawi seems to yearn for the day when Jews are banned and their holy sites desecrated once more, regardless of the suffering that may also befall the Palestinians. During the interview, Ashrawi says that there are “no female Israeli negotiators that take decisions”. Such a statement is objectively false and insulting to Israel’s Chief Negotiator Tzipi Livni, with whom Ashwari is familiar. The other Israeli women negotiators would also be insulted by such a flagrant disregard for the truth and a belittling of their contributions. If we compare the role of women in government in 2015, the percentage of women in Israel’s parliament was 22.5% and in the Palestinian Territories it was 12.9%. New Zealand had 31.4% females in parliament, for comparison. Like New Zealand, Israel has also had a woman Prime Minister; the Palestinians have not had a woman in charge and nor has any Arab state. After prompting by a question from Greave, Ashrawi said she has little hope for peace because of the extremism in the surrounding area, including Syria, and the extreme views of Israeli leaders. The comparison of Israel with ISIS is appalling. Roger Fowler didn’t entirely get away with it on Maori TV so Radio NZ should have been more astute. For Greave, what prevents him from challenging even this most base of hateful lies? Israel is the democratic state of the Jewish people. There are Arab, Druze, Christian, Ba’hai, and secular citizens who contribute at all levels of society, as well as Jewish, and all have equal rights and freedoms. If Ashrawi wants to talk about extreme views she should take a look at what Palestinian leaders say and do. The PLO charter will only allow those Jews living in Israel before 1948 to be citizens of a future Palestinian state and the PA kill Palestinians who want to sell land to Jews. Once more, the double-speak of Ashrawi is plain to see for those who care to look. “The apartheid wall” – The reality is that the “wall” consists mostly of a fence and is no different to many other walls or fences erected to protect civilians from cross-border attack or infiltration. The wall that Israel built following the terror attacks in the early 2000s has prevented much loss of life. The controls on borders and movement (which Egypt also maintains on Gaza) are motivated not by the desire to oppress people, as Ashrawi claims, but the need to protect Israeli civilians from terrorist attack. It does not “prevent Israelis from seeing” what’s going on but rather prevents them from being murdered. “Israel has all the power”- Ashrawi painted a picture of Israel being the much stronger force, with a military and resources that enable it to oppress the Palestinians who have nothing. The reality is that Israel maintains certain controls based on agreements worked out in negotiations with the Palestinians, such as the Interim Agreement of 1985. Furthermore, most of the controls have been put in place in response to terrorist attacks on civilian targets. 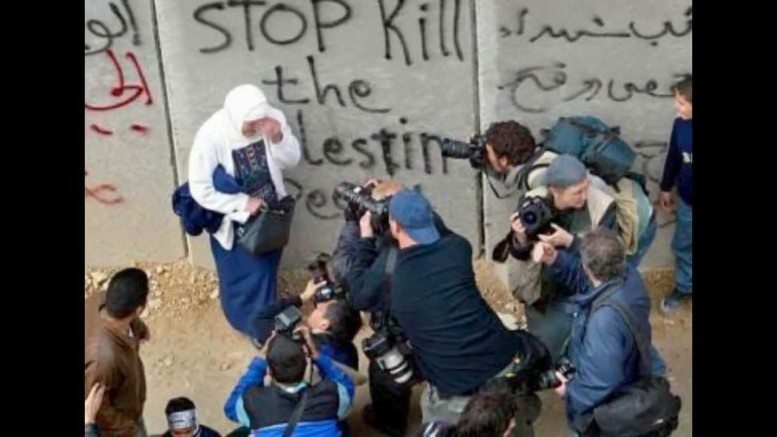 What is missing from Ashrawi’s narrative is the Palestinian unwillingness to accept the Jewish state and the fact that Islamic anti-Semitism deliberately fosters hatred and incites violence against Jews. Ashrawi and Greaves also fail to inform us that the Palestinians receive far more aid per capita than any other people and yet through corruption and diversion to terrorist activity, only a small proportion of the funds helps the Palestinian people. “Settlements are the barrier to peace” – The reality is that no new land has been acquired for the past 15 years; the “growth” of settlements is in the number of people and some buildings, which does not impact the land footprint. Most importantly, Israel has shown that it will forcibly remove Israelis from their homes if there is a chance for peace. Radio NZ has been censured before for allowing a blatantly biased interview by Wallace Chapman to air. Now John Greaves, another veteran reporter, has given a well-known and controversial figure an easy interview while also failing to challenge lies.